Although most commonly used as a spice, turmeric has been used as a medicinal herb in Asia for thousands of years to treat a wide range of ailments from eye infections to leprosy. Turmeric is now being tested for possible benefits in managing various conditions such as cancer, heart disease, and low back pain. Presently, there is not enough information from scientific studies to support its use for any condition. Consult with your doctor before you use turmeric medicinally. The low back bears most of the body’s weight, and is therefore vulnerable to pain resulting from injury or other causes. Symptoms include pain in your low back that may be either a steady ache or a sharp pain that gets worse when you move. Sometimes your low back pain will resolve on its own, although it commonly recurs and may become chronic. Various treatment options are available, including chiropractic, acupuncture, exercise, and supplements such as turmeric. Turmeric has possible anti-inflammatory effects, which may be beneficial for you if you have low back pain. 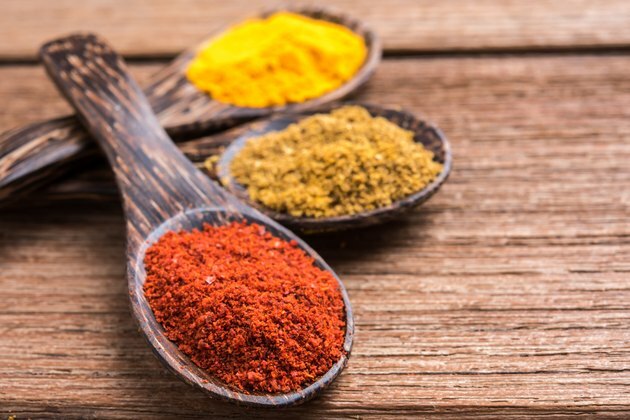 The anti-inflammatory effects of curcumin, an active ingredient in turmeric, have been demonstrated in laboratory studies with animals, according to the Palo Alto Medical Foundation. Preliminary human trials have also shown that curcumin may decrease inflammation, such as in people with osteoarthritis. Research studies for low back pain have used turmeric standardized extracts containing 400 to 600 mg of curcumin per tablet or capsule, taken three times a day, according to the Palo Alto Medical Foundation. Turmeric tincture has typically been used in doses of 0.5 to 1.5 ml, taken three times a day. Other suggested daily doses of turmeric include 1.5 to 3 g of the cut root, 1 to 3 g of dried powder root, and 30 to 90 drops of fluid extract. Turmeric is likely safe when used in food amounts and possibly safe when taken in medicinal doses. However, you may occasionally experience some side effects from turmeric, such as nausea or diarrhea, as well as, allergic reactions. You should avoid turmeric if you have gallbladder disorders, such as gall stones, or within two weeks of planned surgery. You should also not take turmeric if you are pregnant or breast-feeding. How Should I Take Curcumin & Turmeric Supplements?